Business is business. Whether you’re managing a for-profit company or a non-profit association, there are common denominators that demonstrate few differences between the two business models. 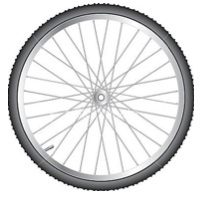 To remain focused on the main goals/objectives of your organization, I compare planning and decision-making to a bicycle tire. Often referred to a “hub and spoke” model, it clearly demonstrates that your core goal (represented by the hub of the wheel) remains strong and supported by the actions and strategic plans that lead to the hub (represented by the spokes of the wheel). So how does this analogy prove useful as you manage your organization? It provides a touchstone for each decision you make and each work group or committee you establish. All strategies and tactics should lead back to supporting the hub. As such, continually ask these questions of yourself and your colleagues: Does my plan or decision support the hub (goal) of my organization’s overall desired outcomes? Are my decisions, project work group, or committee contributing to the overall goal? If so, how do I demonstrate that connection? If not, do I need to reevaluate the relevance or strategic plan of my work group or committee? That said, how does this apply to the adage, “business is business?” It simply means putting aside your own personal feelings, personal agenda, or decisions in the best interest of the business. This is easier said than done. However, an inability to do so results in failure if not today then tomorrow. Your first obligation is to the business and the health of that business and its employees, shareholders, members, and stakeholders. Keep in mind that the leadership and management you provide today determine the legacy you leave tomorrow. ← Is Your Hotel Really Committed to Social Media Marketing? Great article! You hit the nail on the head… Nonprofit organizations and for-profit businesses have much more in common than they often admit. I put together a blog post that references your article as well at http://nrwinnerconsulting.weebly.com/1/post/2014/04/trading-best-practices-business-to-nonprofit.html. Enjoy! Hi Nicolette, thank you for taking the time to comment. It’s always nice to get feedback and certainly a mention in your blog post. I look forward to following your blog.